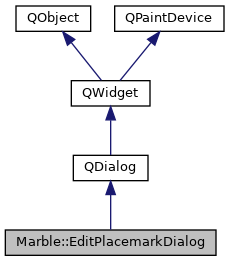 The EditPlacemarkDialog class deals with customizing placemarks. Definition at line 27 of file EditPlacemarkDialog.h. QStringList of ids which could not be used as id. Definition at line 258 of file EditPlacemarkDialog.cpp. isIdFieldVisible tells if targetId field is shown. Definition at line 273 of file EditPlacemarkDialog.cpp. isTargetIdFieldVisible tells if targetId field is shown. Definition at line 268 of file EditPlacemarkDialog.cpp. setIdFieldVisible tells the dialog whether id field should be shown. Definition at line 299 of file EditPlacemarkDialog.cpp. setIdFilter sets filter for id of placemark. filter QStringList with ids which could not be used as id. Definition at line 284 of file EditPlacemarkDialog.cpp. Definition at line 252 of file EditPlacemarkDialog.cpp. Protecting data from input fields changes. Definition at line 304 of file EditPlacemarkDialog.cpp. setTargetIdFieldVisible tells the dialog whether targetId field should be shown. Definition at line 294 of file EditPlacemarkDialog.cpp. setTargetIds sets ids which could be target of placemark. targetIds QStringList with ids which could be target of placemark. Definition at line 289 of file EditPlacemarkDialog.cpp. targetIds gets ids which could be target of placemark. QStringList of ids which could be target of placemark. Definition at line 263 of file EditPlacemarkDialog.cpp. toogleDescriptionEditMode toggles edit mode for description field. textAnnotationUpdated signals that some property of the PlacemarkTextAnnotation instance has changed. updateDialogFields is connected to a signal from AnnotatePlugin in order to update some fields in the dialog as the user interacts directly with the text annotation item. Definition at line 278 of file EditPlacemarkDialog.cpp.